Talking in details about BSNL Dev Bhoomi Plan, the Postpaid Plan launched by BSNL is offering Unlimited Local & STD calls on BSNL network, 1GB 3G data per day, 475 min for calling on other network and 475 Local & National SMS within a monthly billing cycle. Any call on other network beyond 475 min would be charged at 30p/min. BSNL Dev Bhoomi Plan comes with a monthly rental of Rs. 475 (GST Extra). 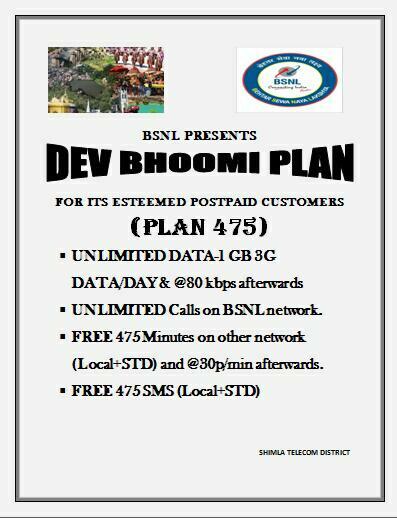 BSNL Dev Bhoomi Plan is available in Himachal Pradesh telecom circle only.